Another year is here, and I have found myself needing a new desk calendar. I am a "flowery" girl, so I chose to use flowers and flourishes to accent my calendar. 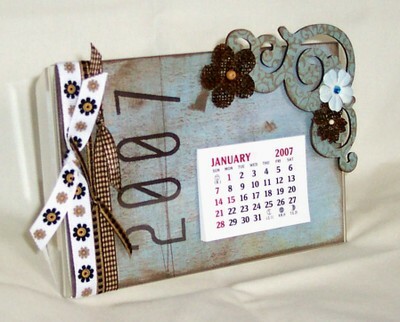 I made my calendar using an inexpensive 4" x 6" acrylic picture frame, laying on its side. I first stamped "2007" on a piece of distressed paper, using the Buzz and Bloom Long Johns Alphabet stamp set. I inserted the stamped paper into the picture frame. Next, I inked up a Buzz and Bloom Round Corner Flourish chipboard piece with chalk ink. 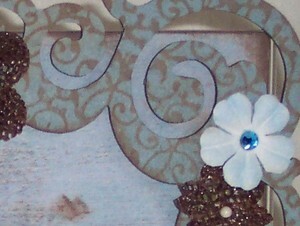 I overstamped onto the chipboard piece with a flourish design stamp. Coordinating brown and floral ribbons were tied around one end of the frame. The stamped chipboard flourish was attached to one corner of the acrylic frame so that it slightly overhung the edges of the frame. A small "tear away" calendar was attached. I finished the calendar off, by using some flower and jewel embellishments. I am very happy with my new desk calendar. Each time I look at it, this calendar gives me a cheery and positive outlook for the year. I'm off to another good year...using my new Buzz and Bloom stamps and chipboard. Oh wow what you have done to this scroll is so beautiful. Thanks for the inspiration. Love that chipboard accent...who wouldn't want this cutie on a desk? !